MANY MODERN industrial processes involve the use of highly concentrated and potentially dangerous chemicals. Information from studies into possible detrimental health effects caused by long-term or short-term exposure to chemicals is made available on safety data sheets. In the workplace there is a need to minimise workers’ contact with any substance that may have an adverse reaction to human health. Working safely with these hazardous chemicals requires adherence to strict safety procedures and the use of specially designed personal protective equipment (PPE). In terms of splashes and spills from liquid chemicals, the hands of the worker can be of particular concern. Therefore, specialist gloves have been developed to protect workers hands against exposure to chemicals. The level of protection against chemicals provided by a particular glove will depend not only on the construction of the glove, but also on the materials (usually the polymer or polymers) the glove is made from. These materials need to be resistant against the chemicals the gloves are intended to be used with. The polymer or polymers used in suitable gloves protect the hand and lower arm by preventing the chemicals from coming into contact with the inside of the glove. To be effective, each material must not only resist the passage of the chemicals through its structure either by direct penetration or permeation, but must also resist degradation by the chemicals that would lead to such damage as cracking or holing when the glove is flexed or stretched during use. A European standard for gloves protecting against chemicals, EN 374-1, was first published in 1994, and subsequently revised in 2003. The current version of this standard is EN ISO 374-1:2016. This standard contains the terminology and performance requirements for chemical protective gloves. There are various changes between the 2003 version of EN 374-1, and the current EN ISO 374-1 version. One of the major changes was in addition to penetration and permeation testing, degradation testing became mandatory for all chemical protective gloves. However, the obligation to test chemical protective gloves for mechanical properties in accordance with EN 388 has been removed. This is now an optional test for glove manufacturers who wish to claim both chemical and physical protection in their product. The movement of a chemical through a material, seam, pinhole or other imperfection on a non-molecular level is defined as penetration in EN ISO 374-1. All chemical protective gloves shall not leak when tested in accordance with the test method EN 374-2. This test method consists of two procedures – testing to determine whether water or air will penetrate the glove. For the air leak test, the glove is immersed in water and its interior is pressurised with air (see figure 1). If a stream of bubbles are observed coming from the surface of the glove then this would indicate a leak. A similar principle is applied to the water leak test. In this assessment, the glove is filled with water and any leaks are detected by the appearance of water droplets on the outside surface of the glove. Permeation is the process through which a chemical moves through a material at the molecular level. Testing permeation resistance is carried out in accordance with EN 16523-1:2015 and involves exposing the outer surface of the glove material to the challenge chemical in one chamber of a two-part cell. 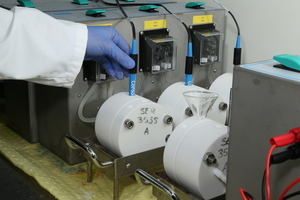 The other chamber contains the collection medium (typically an inert gas or liquid), which is connected to the detection system (for organic solvents this is usually a Gas Chromatograph with Flame Ionisation Detection (GC-FID) or a conductivity meter for chemicals diluted in water). As such, the glove material is acting as a barrier separating the challenge chemical from the collecting medium. During the test, the amount of test chemical that permeates through to the inert collecting medium is measured until a predetermined permeation rate is reached – 1µg of chemical per cm2 of material per minute of the test. The time for this to occur (known as the 'breakthrough time') is the important value obtained as a result of the test. This determines the material's performance level and these are defined in table 1. The challenge chemicals will depend upon the end-use of the glove and the glove type the manufacturer wishes to obtain. EN ISO 374-1 contains a list of 18 challenge chemicals (see table 2) whose code letters can be used on the glove marking, but other chemicals and mixtures can also be tested to EN 16523-1. Three test specimens are taken from the palm area of the glove. For gloves longer than 400mm, and where the cuff is also claimed to provide protection, another three test specimens are also taken from the cuff. If the glove contains a join or seam in the hand area, this must also be tested. Test results are reported based upon the lowest breakthrough time achieved by any of the three test specimens. There are six permeation performance levels with level 6 being the highest level of protection, signifying a breakthrough time of greater than 480 minutes. Degradation is the process through which a change to a material occurs – for the purposes of EN ISO 374-1 degradation will be due to contact with a challenge chemical. Indications that degradation has occurred include flaking, swelling, change in appearance, and hardening of the material tested. Assessing the degradation of glove materials was a new addition to EN ISO 374-1:2016. Degradation is determined for each of the chemicals claimed in the user instructions, and on the marking. Testing shall be carried out in accordance with EN 374-4. If a protective glove is longer than 400mm in length, and permeation testing has been carried out on both the cuff and the palm, degradation testing shall at least be carried out for the area which achieved the lowest permeation result. The principle of the test is that a change in puncture resistance of the material is measured after continuous contact of the external surface with a challenge chemical. The force required to push a stylus through the glove material is measured, both before and after exposure to the challenge chemical. Type C have achieved at least a level 1 against one of the chemicals listed in EN ISO 374-1. Reference to the standard EN ISO 374-1 shall be given for each of the three categories, as well as listing the glove type. User instructions in accordance with the requirements given in EN 420 must be supplied by the manufacturer. In addition, chemical glove user instructions need to include the results of penetration, degradation and permeation testing. There should be a list of all the chemicals against which the gloves have been tested, in addition to the performance levels for permeation testing. 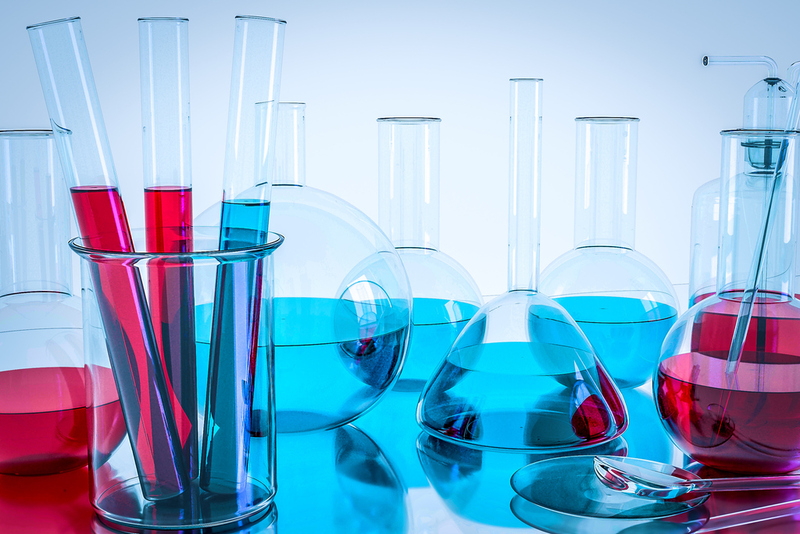 There are a number of specific warnings that should be highlighted, including drawing the user’s attention to the fact that the level of chemical resistance may be different if the chemical is used in a mixture. If the gloves are intended to be reused, then instructions must be provided for decontamination. If no information is given regarding decontamination, it must be stated in the user information that the glove is for single use only.